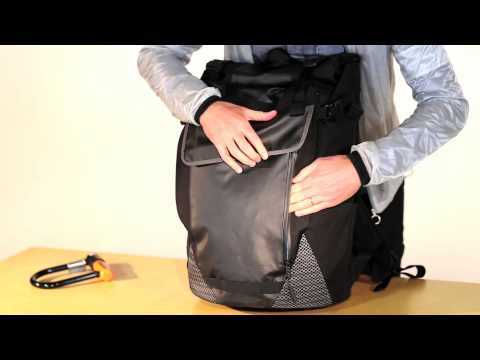 An expandable bike pack that carrys even big, weirdly shaped objects comfortably. The flexible back panel lets you move through the urban obstacle course. A waterproof internal pocket keeps documents or electronics dry in wet weather. Weatherproof design has a waterproof roll-top closure, zippers, and TPU front pocket flap. Internal drop liner uses waterproof seam-trap construction. Flexible back panel allows air circulation and full mobility. Comfort shoulder straps have routing guides for headphone wires or hydration hoses. Waterproof, internal welded pocket fits up to 15in. laptops. Main compartment is accessible through swing-around side entry without removing the pack, or through the rolltop. Compression straps let you compress or expand the pack to carry an extra wheel, a skateboard, or other oversized items. Multiple quick-access pockets on both front and back. U-lock holster doubles as a water bottle pocket. Sternum strap and detachable waist strap.